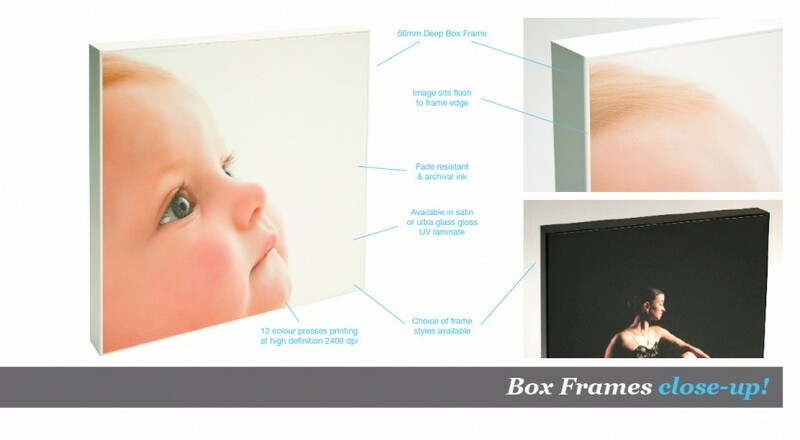 A photographic print is mounted to a solid PVC board and perfectly inset into our box frames so that the image sits flush to the front profile. There is a choice of two laminate options to finish your print, a smooth satin or an ultra glass gloss finish. This high gloss is an acrylic like effect and should not be compared to standard gloss films. Our 2 inch deep wooden box frames have a smooth finish and are currently available in white or matt black. The frames come ready to hang with two steel hangers, and will sit flush to the wall. Have your images mounted onto a 2mm thick aluminium sheet with brushed edges for that contemporary urban look. 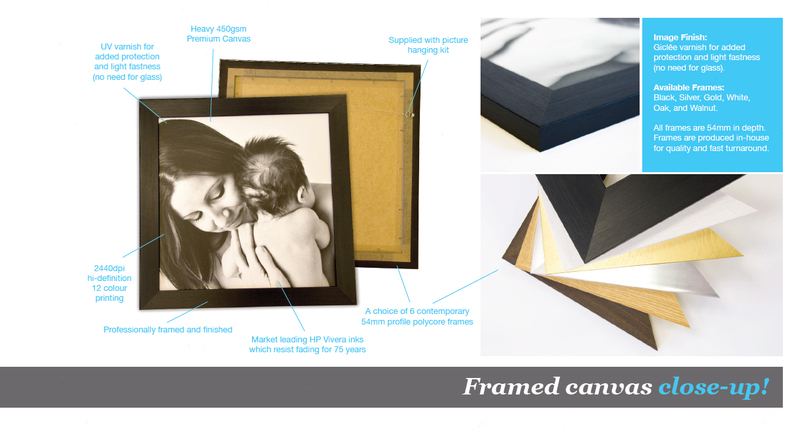 Your photo will be printed and laminated in a Satin finish and then bonded directly onto 100% solid aluminium sheeting. A custom made wooden sub-frame is attached to the back to give your image a floating appearance and to give rigidity to the product. 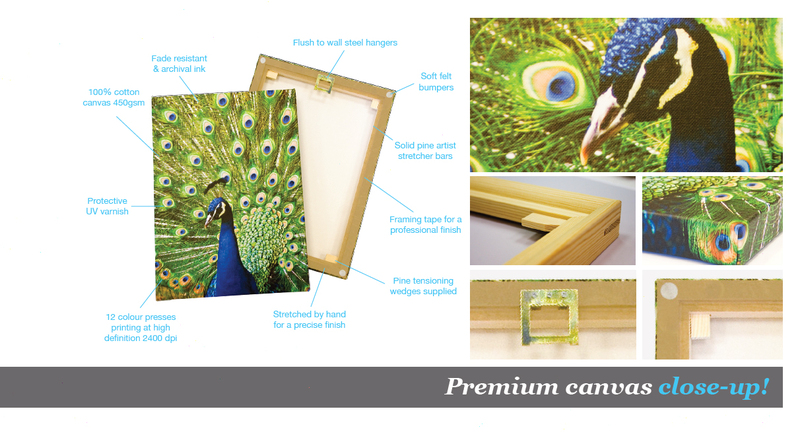 Our premium canvas print is the highest quality canvas on the market and at the best value. This premium canvas print is on a heavy 450gsm and made from 100% cotton for that authentic artists’ canvas. 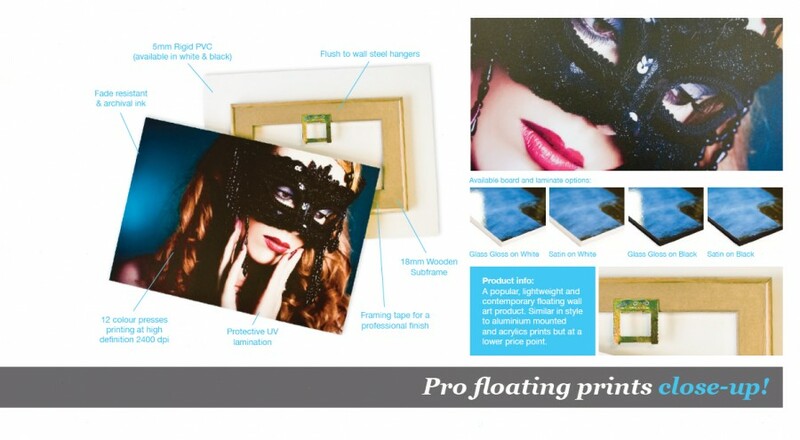 Our New ‘Pro Floating Print’ is a premium product perfect for any home. The print is mounted to a rigid 5mm PVC board and sealed with a pressure sensitive laminate. A recessed wooden frame attached to the rear creates the floating effect and completes the product. 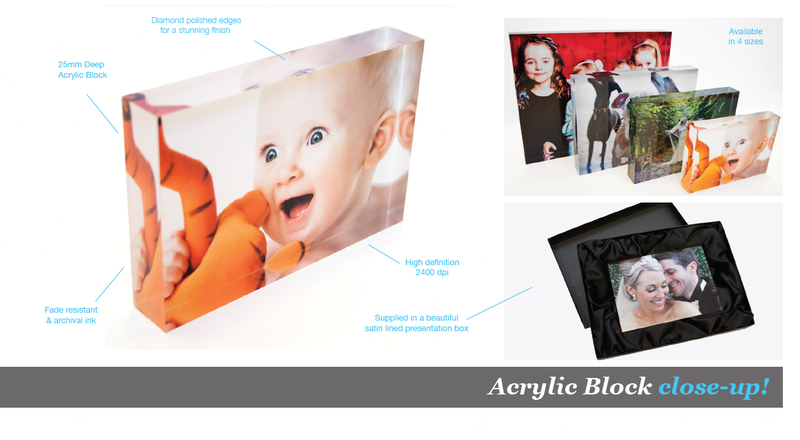 A popular contemporary alternative to frames, our Acrylic Photo Blocks bring the image to life with an enhanced hi-definition and 3D like finish. Your cherished memories will be beautifully preserved as we use only the finest fade resistant inks. No need for nails or stands, these 25mm deep blocks are free standing with diamond polished edges. We also use a silver backed material which not only looks great but prevents light shining through the photo creating unwanted shadows. 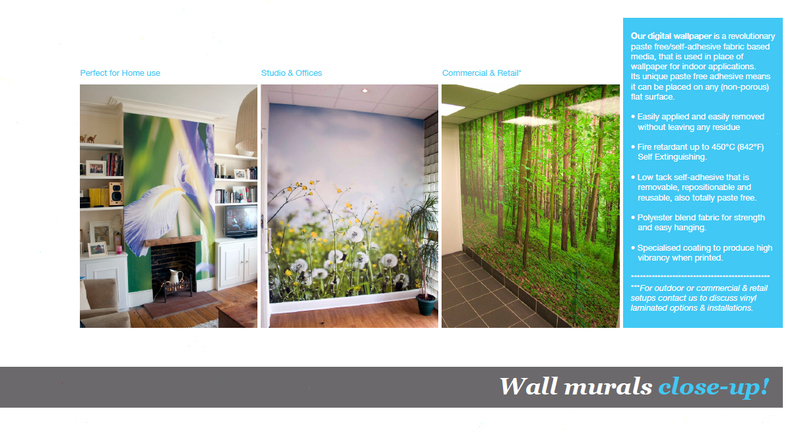 Our fabric wall murals are made to your own specific measurements on self-adhesive wallpaper. That means no paste, no mess and re-positionable! It can be stuck onto walls, doors, and furniture and is easily removed without residue. The wallpaper is supplied in panels making it easy to apply, just peal away the backing and place it onto the wall smoothing out any air pockets with your hand or a dry cloth. 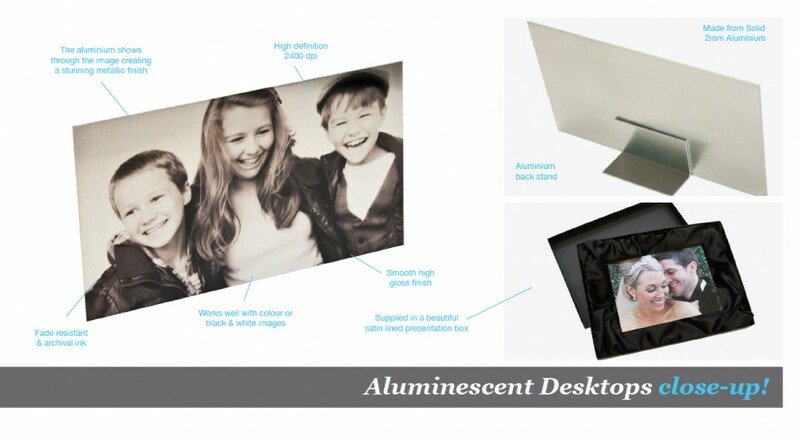 Aluminescent Desktop Portraits offer a unique and striking way to present your photographs. Your photographs are printed on a special film and bonded directly onto a high-grade 2mm aluminium sheet, creating a stunning metallic effect with a high gloss finish. 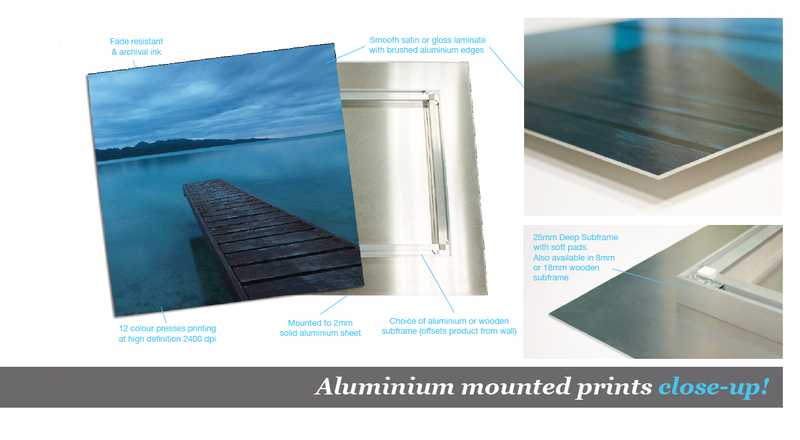 A discreet aluminium stand is also attached to the reverse making this a wonderful desktop photo product. All aluminescent desktops are supplied in a beautiful hand crafted & satin lined presentation box.